If you have seen him—sometimes brilliant, sometimes frustrating, ever the work-in-progress—the Redskins will remain what they have been for years … a team capable of beating the best in the NFL one week, and losing to the worst the next. A team that will, ultimately, fall short of expectation. If you have not seen him, however, and the man wearing "17" in burgundy and gold jogging onto the field at Giants Stadium on September 13 turns out to be the guy they were talking about in Ashburn just a week ago … hold on to your hats. The notion that Jason Campbell is the key to their season is hardly novel—you can’t find a Redskins piece these days that doesn’t cover that angle. But not many drill down just how close the Redskins might be to breaking out, how dependent that possibility is on Campbell, and just how close Campbell might be to making that jump. Let’s take it macro to micro. Ownership is in place. For all the fits, starts, learning curve and unresolved philosophical cranial flatulence concerning the offensive line, Dan Snyder is serious about procuring the pieces. If you can find a lifelong Lions, Bengals or Cardinals fan, see if they can say the same with a straight face. The Coaching Staff is in place. Head Coach Jim Zorn enters his second year under the big headset with all the attendant advantages—familiarity with his players, coaching staff and rhythms of the job, and a full year to adapt and refine his roster and offense to fit one another. He has acquired one invaluable thing that can only be gained one way … experience. And with solid assistant coaching up and down the line (DC Greg Blache, OL Coach Joe Bugel, DB Coach Jerry Gray, et al), Zorn will not go to battle alone but flanked by battle-hardened lieutenants. The defense is in place. Last year's 4th-ranked overall unit (7th passing; 8th rushing) didn’t stand pat and didn’t tinker, it upgraded—big time. The Redskins added DT Albert Haynesworth, consensus “Best Available Free Agent” and arguably most dominant defensive lineman in football, rookie DE/LB Brian Orakpo, on the short list of best pass-rushing prospects in the 2008 NFL Draft, and early training camp surprise DE Jeremy Jarmon from Kentucky. Factor in another year of maturity for young veterans S LaRon Landry, CB DeAngelo Hall, S Chris Horton, DT’s Anthony Montgomery and Kedric Golston and LB Rocky McIntosh, plus solid leadership from such as LB London Fletcher, DT Cornelius Griffin and returning DE’s Phillip Daniels and Renaldo Wynn. Stir them together under the steady hand of Greg Blache, and it is hard to envision a dropoff. Logic suggests instead that the Redskins defense will be better, maybe even dominant. Offensively, things are less clear, but perhaps not as dire as many would have you believe. Last year at this time, criticism came from many quarters about how the Redskins had badly neglected the defense by using their top three draft selections on offensive players. Specifically, on skill players brought in to do something all agreed was a serious concern—upgrading the passing game. WR’s Devin Thomas and Malcolm Kelly and TE Fred Davis are no longer rookies and no longer afterthoughts. If eve one of the three emerges as a legitimate weapon to complement WR Santana Moss in 2009, the upgrade could be dramatic. Give a Peyton Manning or Tom Brady an array of Santana Moss, Devin Thomas, Malcolm Kelly, Antwaan Randle El, Chris Cooley, Fred Davis and Todd Yoder, and you would hear few complaints about the receiving corps. Behind RB’s Clinton Portis, Ladell Betts, Rock Cartwright (and/or whichever of the young lightning bugs emerges from training camp among Anthony Aldridge, Dominique Dorsey and Marcus Mason) and big FB Mike Sellers, the running game may not be top five in the league, but top ten is not a stretch, particularly if they ever get to face honest defenses, no longer stacking the line or scrimmage because the Redskins pose no legitimate passing threat. The offensive line, of course, is where many suggest the season will turn. I disagree … and bear in mind I do so having yelled from the rooftops as loudly as anyone about this franchise's inexcusable neglect the offensive line for the past decade. The Redskins are going to have bad days in pass protection this season. Count on it. Thing is, with breakout quarterbacking they could have a breakout season anyway. And from where I sit, only one question mark remains as to whether or not Jason Campbell is the man to lead the charge. Cannon arm capable of any NFL throw? Check. Leadership? Check-minus. It might not be Manning-esque, and may not always not show from the stands, but the unqualified, unsolicited supportive locker room comments from teammates over four years speak volumes. Pocket presence and processing speed? Ah … the heart of the matter. Jason Campbell can step up in the pocket and make any throw required of an NFL quarterback; he’s done it often enough to prove the point. He has a tendency still to drift backwards away from an edge rush rather than step up in games where he’s been pin-balled all day, but you won’t find many QB’s who don’t. Where Jason Campbell remains a question mark—and the key to the success of the 2009 Washington Redskins—is whether or not he can make the equivalent of the plays not below, one by Todd Collins and one by Colt Brennan. The kind of play that is often the difference between a hard fought win and a heartbreaking loss. The kind of play that is pure read-and-react instinct. The kind of play that requires a deft touch throw under duress, from an off-balance platform, in the face of a fierce rush, in the deciding moments of a game. The kind of play we have not often seen from young Jason Campbell. - 13:57 of 2nd Qtr: Campbell steps up, reads, fires accurately. - 2:49 of 2nd Qtr: Campbell hesitates, drifts, holds too long, pays steep price. - 13:29 of 3rd Qtr: Collins pass to Portis in the flat, under control, accurate, decisive. - 2:43 of 4th Qtr: Collins TD to Betts. Reaction, timing, accuracy, touch. You can’t teach those plays—instinct, reaction time and accuracy under duress are gifts. You either have them or you don’t. 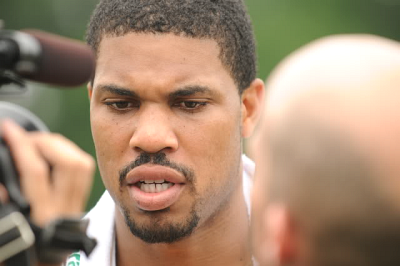 To date, Jason Campbell has not shown he possesses them in sufficient quantity to make the leap from average to elite. Truth is I still see Jason Campbell as miscast in Jim Zorn’s offense. I still think he’s the classic drop-back, downfield play-action passer Joe Gibbs drafted him to be, not the step-and-fire, quick-release surgeon Jim Zorn needs him to be. But I’ve also seen enough good things from Campbell to hold out hope that he can still speed up his game enough to finally force defenses to play the Redskins honestly again. To not allow them to stack the line of scrimmage, pin their ears back and attack a shaky pass-protecting OL with little respect for and no real fear of the quarterback's ability to made them pay. If Campbell has made real strides this offseason, and can reduce by a fraction of a second the time between what his eyes see as he drops from center and the ball leaving his hand in response … the results will be clear and perhaps startling. It won’t happen in one game, maybe not even two or three. Defensive coordinators around the league will begin this season as they have the past several, believing that the way to shut down the Washington Redskins offense is to throw the kitchen sink at their quarterback and count on making more plays than they give up. Only one thing will force them to adjust ... a quarterback who makes them pay for their aggressiveness, coming up with the one or two key throws a game at the most crucial times, when a split-second decision and accurate touch throw ultimately decides whether Redskins Nation spends its Monday thumping its collective chest or kicking its cat. Preseason game or not, come Thursday night when the Redskins open their season in Baltimore, I’ll be looking for indications of whether or not we have, in fact, seen Jason Campbell. Jason Campbell brought us back from the dead in the Saints game last year. I was there for that one. I can still feel the thrill of victory down 9 in the the 4th quarter. That broken play to Cooley then the 68 yard floater to Moss. Sweet! The intangibles are there. We just need to see more of that. Zorn needs to unleash the dragon! Great comments, it is very true that the Redskins season relies on the QB's ability to quickly process what is happening on the field and make plays. I think JC will incrementally improve, but not dramatically. Zorn and management already realize this. I expect Colt to play a lot this preseason, they are testing him out to see what he can do. In the end if they stick with JC we will be OK, if Colt plays well enough to start we could be great. "Truth is I still see Jason Campbell as miscast in Jim Zorn’s offense. I still think he’s the classic drop-back, downfield play-action passer Joe Gibbs drafted him to be, not the step-and-fire, quick-release surgeon Jim Zorn needs him to be." That sums it up. Separately, I disagree that JC is key to the season. If our OL can't block, nothing else on the offense will matter. My question is, if the team bombs because the offense continues to struggle, and they struggle because the OL is poor, then why will there be a call to fire Zorn? I think we're approaching year 2 of the 3 year plan that started after Gibbs up and left. Next year we draft & sign an OL and get JC back cheap (given that he'll struggle behind our current OL and thus won't have bargaining leverage). Thanks for the read and comments. I'll respectfully disagree that if the OL can't block "nothing else will matter." A QB can help out his OL with quick decision-making as much if not more than an OL can help out its QB with great pass pro. The split second I'm talking about in the piece, and illustrated in particular the two plays in the clips (Collins-to-Betts, Brennan-to-some-guy-off-the-street), is nothing less than the difference between winning and losing in the NFL. Even with the likely OL problems, I think this Redskins team is solid enough to contend if they that specific king of playmaking from Jason Campbell in 2009---something he has yet to show me. As to Zorn, it's way too early for me to comment seriously on his future. More will go into Snyder's decision on whether or not to keep him after this season than just the W-L record, the QB play, the OL or any other single thing. The list of potential factors I can think of off the top of myhead would be far too long to list here. Let's save that for another tome down the road a bit. I always felt Campbell moved a bit slow, and I think I still feel that way, but ultimately, the bottleneck to his progress is definitely his 'processing speed'. Blame it on lack of confidence, lack of preparation, bad coaching, or just the inability to make decisions that split second faster, but regardless of why, our season will likely reflect whether or not the issue has been resolved. I should clarify. When I said "if the offense can't block, nothing else will matter," I was referring to both pass and run-blocking. Looking back to when our Oline was healthy last year, around week 5, our run game was very effective and that opened up everything (Portis was even leading the league in rushing for a stretch). If our Oline picks up where it left off at the end of last year though, with little room to run and not much time for JC, then I just don't see how we can win. With a good running game, a QB can help compensate for poor pass protection somewhat (as we resorted to last year by abandoning the 5-step drop), but even a bionic QB couldn't save us. It'll be more of the same as the end of last year if the OL doesn't improve. I thought the Dockery comeback was a head-scratcher. He's fine in the running game, but can be a liability in pass pro. So, if we're trying to move from a Gibb's offense to the WCO, why bring in him? Shouldn't our line start to look like the undersized but quick-footed Colt's OL? I like your (qualified) optimism though.